May 23 is National Taffy Day. Today you can snack with your favorite candies at any time, of course in form of celebration. Taffies are available in many flavors and colors. The most popular are fruit flavors, like banana and lemon, but actually anything can go. Even salt water! But the very first taffies were flavorless. Later molasses and vanilla were added to make candies better. That was the beginning of experiments with different flavors. Color experiments began much later and they were designated to match the flavor of the candies. One may think, that chili taffy is the most unusual one, but we disagree. Salt water taffy is the most interesting candy. Contrary to popular belief, saltwater taffy isn't made with saltwater, but really contains water and salt. There are many rumors on that how they were created. The most popular legend says, that a candy store was flooded during the storm, and the candies soaked in saltwater. 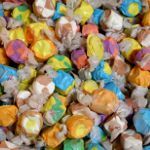 When a little girl came to buy a taffy, the owner said, that she could offer her only salt water taffy. Little girl was delighted with it and bought one. She brought the candy to show her friends. Mother of shop owner heard the conversation and loved the name of the candy. That is how salt water taffy was born. Chose your favorite taffies to celebrate the holiday and share them with your family and friends.